The cruel fact is that it takes a marketer more than 10 years to really grasp the essence of writing a successful marketing campaign. What is the secret behind? A successful marketing campaign is a piece of message that is able to seize customers’ attention, convey clear instructions, and get customers to follow what you want. A for Attention: Attention is the foundation of everything. Once you lose it, you lose it all. If you are sending mass emails to your customers, make sure you catch your customers’ attention in the email subject. Use professional email marketing software like 1and1Mail and MailChimp to personalize each email message and test different styles of subjects. B for Benefits: What’s in it for me? People need to fight for resources to survive. According to Maslow's hierarchy of needs, people seek for food, safety, love, self-esteem and self-actualization. Do you really know what your customers want? What needs do your products or services satisfy? C for Credibility: Why should I trust you? Why should I trust what you say? Do other people trust you? Present your expertise in your area. Be specific. Sometimes, revealing a few of your weaknesses can boost your credibility. Therefore, be honest. D for Difference: Why should I choose you, not others? What can you do differently than others? Make the difference tangible. Keep in mind that people may not need the best product or service, but the most suitable one. E for Evidence: Provide strong evidences. Half of human’s brain is for logical thinking. Make your evidence easy to understand. Do not make customers think. F for Fair +: Is it a fair deal? People are always looking for spending less and getting more. That’s how we stay alive and continue to thrive. The more you provide, the more people are likely to buy. So prove it to me. G for Go: Add “Call To Action” at the end. It is easily ignored by many marketers. Even Apple’s marketers made such kind of mistakes! Make the action easy to do. Otherwise, you waste all the efforts before. Not doing anything is always safer than doing something different offered by you. Safety is always on people’s top priority. Therefore, ask your customers to make a little step forward. Once they get started, it is much easier for them to follow through. These 7 secrets above can also act as a checklist for every marketer to review their marketing campaign before printing out the ad or sending out mass emails. Want to complete the above list from H-Z? Leave your comment below. Attention is essential for your email. A for Attention: Attention is the foundation of everything. Once you lose it, you lose it all. Use your email subject to catch your customers’ attention. Draft at least 5 different subjects and then choose the best one. Run A/B test whenever possible and let your customers tell you what is best. B for Benefits: What’s in it for me? According to Maslow's hierarchy of needs, people seek for food, safety, love, self-esteem and self-actualization. What do your customers want? What needs do your products or service satisfies? C for Credibility: Why should I trust what you say? Present your expertise in your area. Be specific. Sometimes, revealing a few of your weaknesses can boost your credibility. D for Difference: Why should I choose you, not others? What can you do differently than others? Make the difference tangible. E for Evidence: Provide evidences. Make your evidence easy to understand. Do not make customers think. F for Fair +: Is it a fair deal? Can I spend less and get more? People look for fair deals in order to stay alive and thrive. Prove it to me. G for Go: Add “Call To Action” at the end. Make it easy to do. Otherwise, you waste all the efforts before. Not doing anything is always safer than doing something different offered by you. Therefore, ask the customers to make a little step forward. Once they get started, it is much easier for them to follow through. These 7 laws can also act as a checklist for every email marketer to review their email marketing campaign before clicking the send button. Want to complete the above list from H-Z? Leave your comment below. Last but not least, download 1and1Mail to compose your persuasive email marketing campaign now. Are all the links working and linking to the correct webpages? Do you provide a plain text version of your email? Do all the images have alt tags? Do all your pictures have links and are they linked correctly? Do you personalize each email? Do you provide an unsubscribe option in your email? Do you explain who you are and why your customer should trust you at the beginning of the email? Are you tracking the clicks in your email using tools like Google Analytics and bit.ly? Have you cleaned up your list (bounce-backs and unsubscribers from your last email campaign? Have you tested how your email look in different web email platforms and email clients? 1and1Mail allows email marketers to personalize each email message to their recipients. Other than email marketing, let's look at more cases on how personalization has been applied to the Internet. 1. Personalized Search: In the past, everybody saw the same results when they searched the same keyword. Nowadays, search engines, such as Google, Yahoo and Bing, are monitoring your search history, search patterns and signals from your social networks to personalize your search results. 2. Personalized Recommenders: People have different favors. It is not effective to show everyone the same items when they visit your online store. So far, Amazon has done the best job in predicting what you want and like based on your click streams and purchase history. When you revisit their website or in your email inbox, you can see personalized recommendations every day. 3. Personalized Price: Different people have different price sensitivity. With technology, websites are able to know the customer better and offer them the best price at the right time to boost sales. 4. Integration of Personalization Strategies: Of course, if a site can apply all of the above personalized strategies together, it can achieve the best conversion rate. Apparently, Amazon is a good model to study. Check out their Today's Deals, Wish Lists, Browsing History and email marketing campaigns once in a while, and you can learn a lot about personalized Internet Marketing skills. On the other hand, personalization may introduce privacy concerns for some users. Marketers should watch out local rules when implement relevant online marketing strategies. Download 1and1Mail 3.2 to start personalize your email marketing campaigns! How to Increase Email Open Rate Quickly? 1. 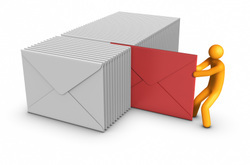 Sender's Name: Do your recipients know you? Emails with a known sender would be much more likely to be opened. When customers signed up your email newsletter, have you made it clearly that from whom they were expecting to get an email? 2. Email Subject: If you were the customers, would you open it? Is it easy to understand? Is it attractive enough? It works much better if you could customize the email subject to each of your recipient. It makes people feel respected. Go ahead and make changes, and you'll see your email campaign open rate improve!